Prevention of poxvirus infection is a topic of great current interest. We report inhibition of vaccinia virus in cell culture by porphyrins and phthalocyanines. Most previous work on the inhibition of viruses with tetrapyrroles has involved photodynamic mechanisms. The current study, however, investigates light-independent inhibition activity. The Western Reserve (WR) and International Health Department-J (IHD-J) strains of vaccinia virus were used. Virucidal and antiviral activities as well as the cytotoxicity of test compounds were determined. Examples of active compounds include zinc protoporphyrin, copper hematoporphyrin, meso(2,6-dihydroxyphenyl)porphyrin, the sulfonated tetra-1-naphthyl and tetra-1-anthracenylporphyrins, selected sulfonated derivatives of halogenated tetraphenyl porphyrins and the copper chelate of tetrasulfonated phthalocyanine. EC50 values for the most active compounds are as low as 0.05 µg/mL (40 nM). One of the most active compounds was the neutral meso(2,6-dihydroxyphenyl)porphyrin, indicating that the compounds do not have to be negatively charged to be active. Porphyrins and phthalocyanines have been found to be potent inhibitors of infection by vaccinia virus in cell culture. These tetrapyrroles were found to be active against two different virus strains, and against both enveloped and non-enveloped forms of the virus, indicating that these compounds may be broadly effective in their ability to inhibit poxvirus infection. Smallpox, while not found in the world's population at present, remains a potential health hazard especially due to the possibility of its use as a bioweapon [1–5]. There is currently no accepted treatment for smallpox, although a number of agents have been evaluated . Therefore, new therapeutic or virucidal agents could have great utility in slowing both the progression and spread of the disease in an epidemic situation. In the present study, we have investigated the potential of porphyrins (Por) and phthalocyanines (Pc) to prevent infection by vaccinia virus in cell culture. Porphyrins were obtained from Midcentury Chemicals (Chicago, Illinois) or Frontier Scientific (Logan, Utah) and used as received. Porphyrin designations are as follows: PP, protoporphyrin IX; HP, hematoporphyrin IX; TPP, meso-tetraphenylporphine; TNapPS, sulfonated 5,10,15,20-tetra-naphthalen-1-yl-porphyrin; TAnthPS, sulfonated 5,10,15,20-tetra-anthracen-9-yl-porphyrin. Other porphyrins are tetraphenylporphyrin derivatives, e.g., TPP2F is tetraphenylporphyrin with a fluoro group at the 2-position on each phenyl ring. An "S" at the end of the name indicates that the parent porphyrin was sulfonated. In most cases, these are mixtures with variable numbers of sulfonates and/or positions of the sulfonates on the ring. The sulfonated copper phthalocyanine [sold as CuPcS(3,4',4",4"')] was purchased from Aldrich. CV-1, BSC-40 and TK-143B cells were maintained in Dulbecco's modified Eagle's medium (DMEM) supplemented with 10% fetal bovine serum (FBS) and incubated at 37°C, 5% CO2. CV-1 cells were utilized for virus titer determinations and TK-143B cells were used in virus stock preparations. HeLa S3 cells were grown at 37°C in RPMI 1640 culture medium supplemented with 10% FBS and the antibiotics penicillin and streptomycin. Two strains of vaccinia virus (VV) were used in this study: the Western Reserve (WR) and International Health Department-J (IHD-J) strains. The WR strain, produced by Virotech International (Rockville, MD), was a gift from Dr. Mark Feinberg (Emory University). The IHD-J strain was grown as described previously . TK-143B cells, grown in roller bottles, were infected with the WR strain of the virus and incubated for 2 days at 37°C. The cells were collected, resuspended in a buffered solution of 10 mM Tris-HCl (pH 9) and homogenized with 20 strokes in a Dounce homogenizer. Large debris and nuclei were sedimented by centrifugation at 1,400 rpm for 5 min. The supernatant was collected and trypsin (250 µg/mL) added. This was then loaded on a 36% sucrose cushion and the virus pelleted by centrifugation at 13,500 rpm for 80 min using a Beckman SW28 rotor. Extracellular particles of IHD-J were obtained by infecting TK-143B cells. After 24 h incubation at 37°C, the culture medium was pre-cleared and the virus was concentrated by centrifugation at 13,500 rpm for 80 min in a SW28 rotor and resuspended in 1 mM Tris-HCl (pH 9). A plaque assay was used to determine the ability of test compounds to prevent infection. Compound stock solutions, 5 mg/mL, were diluted 10-fold in DMEM without FBS and mixed with virus particles to five final concentrations: 50, 10, 2, 0.4 and 0.08 µg/mL. After 1 h incubation (in the dark) the virus-drug mixture was diluted 10-fold in DMEM (without FBS) to 500 µL and 100 µL added to each well of confluent CV-1 or BSC-40 cells grown in 24-well plates. This afforded 200 pfu/well (1 × 10-3 pfu/cell). Following virus-drug adsorption onto the monolayer, 1 h at 37°C, cell monolayers were washed twice PBS to remove residual virus-drug mixture. New growth medium supplemented with 2.5% FBS was then added to each well. A plaque assay was used to determine the quantity of infectious particles remaining after drug treatment. Two days after infection, the growth medium was removed and the cells washed twice with PBS. A solution of 0.1% crystal violet, 10% formaldehyde in phosphate buffered saline (PBS) was then added to the wells. After 30 min incubation, the stain was removed and the wells washed with PBS and allowed to dry. The number of plaques was then determined and activity calculated based on the reduction in average number of plaques, in wells where the compound was pre-incubated with the virus, compared to the control wells inoculated with untreated virus. As an alternative to the liquid overlay, agar overlays were also investigated. Similar results were obtained with both assays. Hence, further plaque assays were done using liquid overlays. EC50 values were calculated as response = min + (max-min)/(1+10 [exp(log[drug]-logEC50)] using Kaleidagraph (Synergy Software, Reading, Pennsylvania). Reported EC50 values are the average and standard deviation of three separate determinations, each replicated three times. Confluent monolayers of CV-1 cells were infected with 5 × 105 pfu/well (2.5 pfu/cell) of WR for 2 h at 37°C. The cells were then washed twice with PBS to remove any residual virus. Compound stock solutions, 5 mg/mL, were diluted in DMEM with 2.5% FBS to final concentrations of 50 or 25 µg/mL. This media containing compounds (500 µL) was then added to the cells. At 16 h post-infection, cell monolayers and culture medium were harvested and subjected to several cycles of freeze/thawing to release intracellular and extracellular virus particles. A plaque assay on CV-1 cells was used to determine the virus titer. CV-1 cells were infected with the virus inoculum for 1 h; the growth medium was removed and 2.5% FBS in DMEM added to the cells. After 2 days, the cells were washed with PBS and later stained with a solution of 0.1% crystal violet, 10% formaldehyde in PBS, and the viral plaque number was counted. To determine if viral inactivation occurs after cell lysis, the cell monolayers were washed three times with DMEM to remove the compounds then harvested and subjected to several cycles of freeze/thawing to release intracellular virus particles. Cell proliferation was measured by [3H]-thymidine uptake . HeLa S3 cells (3 × 104 cells/well) were incubated in 96-well plates in the presence of varying concentrations of the tetrapyrroles for 2 days at 37°C, after which 3H-TdR (1 µCi/well) was added. The cells were further incubated for 16 h, then harvested and 3H-TdR incorporation monitored by using a liquid scintillation counter. Data are from a single experiment. CV-1 and BSC-40 cells were seeded at a concentration of 3.5 × 104 cells/well in a 96-well plate and allowed to attach overnight, after which they were ~80% confluent. Compounds in DMEM with 10% FBS were added to the cells. After 2 days, a trypan blue viability assay  was performed. The 50% cytotoxic concentration (CC50) is the concentration required to reduce viable cell numbers by 50% relative to untreated control cell numbers. This was determined by incubation in growth medium containing serial dilutions of compounds in the range of 50 – 2000 µg/mL for 2 days, after which the viable cell numbers were determined. To determine the effect of the compounds on cell proliferation, after 24 h incubation, the cells were washed and further incubated in the absence of the compounds for 1 day, and then a trypan blue assay was done. Data are from a single experiment. CV-1 cells were seeded at 3.5 × 103 cells/well (in growth medium) in a 96-well plate and allowed to attach overnight; the compounds (in growth medium) were then added. Following a 24 h incubation, the cells were counted. Initial screening of porphyrins and phthalocyanines (Figure 1) involved more than 100 different compounds. These compounds were pre-incubated with the virus and then the mixture was inoculated on CV-1 cells and residual virus titers were determined by plaque assay. Based on the results obtained, we were able to determine the most active compounds, that is, compounds at 50 µg/mL that inactivated the virus completely (no plaques seen) (Figure 2). These were chosen as candidates for further study. Structures of tetrapyrroles used in this study. Prevention of virus infection. TPP[2,6-(OH)2], 50 µg/mL, was incubated with vaccinia virus for 1 h, and then applied to cells. Following virus adsorption, the residual virus-drug mixture was removed and new growth medium added. Plaques were visualized after 2 days (as described in Materials and Methods). 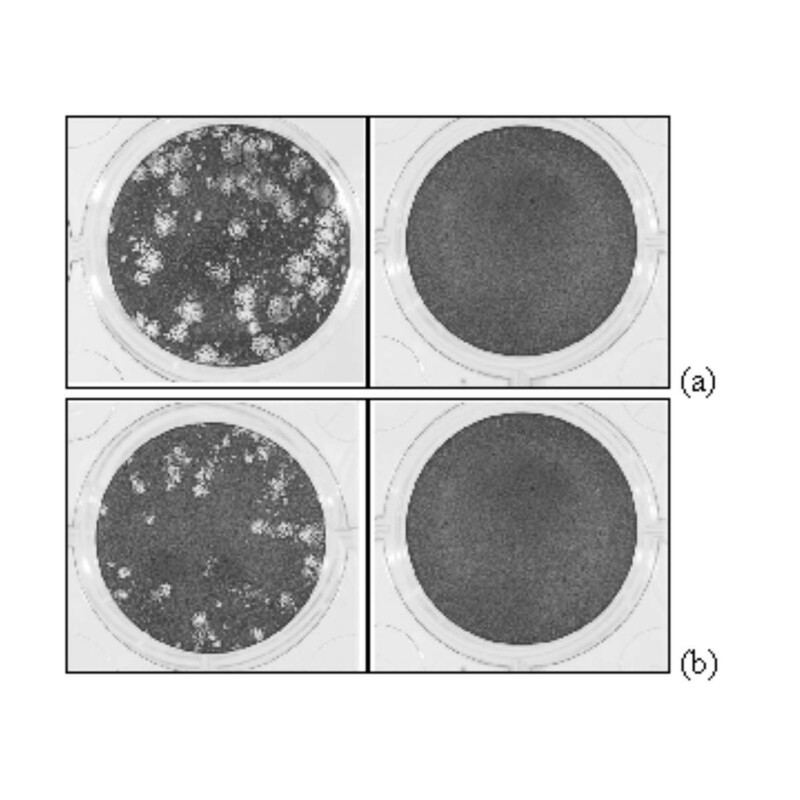 (a) WR and (b) IHD-J incubated with CV-1 cells in the absence and presence of TPP [2,6-(OH)2]. Approximately 20 natural porphyrins (based on the protoporphyrin ring skeleton of hemin) were evaluated. In general, structures with the hematoporphyrin ring (i.e., hydroxyethyl groups at the 2- and 4-positions, see CuHPIX in Figure 1) were found to be more active than structures with the protoporphyrin (see ZnPPIX in Figure 1), mesoporphyrin, deuteroporphyrin or deuteroporphyrin disulfonic acid rings (ethyl, hydrogen or sulfonate at positions 2 and 4, respectively). CuHPIX and ZnPPIX were evaluated in more detail. CuHPIX was more active than ZnPPIX [e.g., EC50 values of 1.5 vs. 25.7 µg/mL for IHD-J (in CV-1 cells)] but neither was as active as the sulfonated porphyrins (vide infra). The ability of these compounds to prevent infection was also compared in BSC-40 cells. Generally, the EC50 data obtained from both cell lines were of the same order of magnitude; however, in the BSC-40 cell line, the WR strain of the virus showed a hundred-fold greater sensitivity to CuHPIX as compared with CV-1 cells (Table 1). Prevention of vaccinia virus infection by tetrapyrroles. A large number of sulfonated tetraphenylporphyrin derivatives was also evaluated. 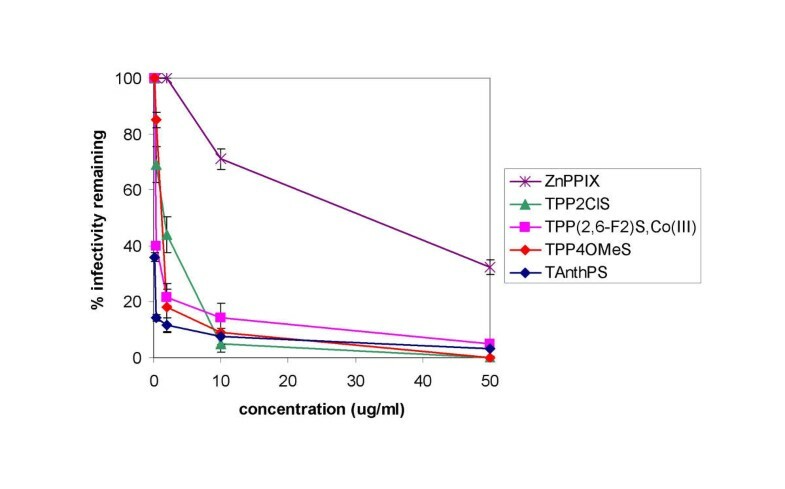 A series of 15 metal chelates of tetraphenylporphyrin tetrasulfonate (TPPS4) was tested, but none showed more than 50% activity at 50 µg/mL using either the WR or IHD-J strains; these candidates therefore were not pursued. A series of 12 tetraphenylporphyrin derivatives made via sulfonation of the 2-F, Cl and Br, the 3-F and Cl and the 4-F and Cl tetraphenylporphyrins was evaluated. Many of these derivatives completely blocked infection by both strains at concentrations of 50 µg/mL (Figure 3). TPP2ClS and TPP2FS were studied in more detail. These two derivatives had similar activities (within a factor of 4) in the WR and IHD-J assays. A series of sulfonated derivatives of the 2,6-difluoro and 2,6-dichlorotetraphenylporphyrins was also studied. The parent compounds and the Co(III) chelate of the difluoroporphyrin completely inhibited infection at 50 µg/mL; the Co(III) chelate had EC50 values of 1.6 (CV-1) and 0.74 µg/mL (BSC-40) in the WR assay and 0.44 µg/mL (CV-1) in the IHD-J assay. The other compounds tested were less active, i.e., at 50 µg/mL, they inactivated the virus by less than 50%. Four non-halogenated porphyrin derivatives with aryl side chains, TNapS, TAnthS, TPP[2,6-(OH)2] and TPP4OMeS, had high activity (Table 1). All of these had EC50 values of < 5 µg/mL in both assays. TNapS and TAnthS were more active against the IHD-J than WR strain (Table 1) using CV-1 cells. TPP[2,6-(OH)2] also had high activity. EC50 values were 0.17 (CV-1) and 0.19 (BSC-40) µg/mL for the WR assay; and 0.7 (CV-1) and 0.32 µg/mL (BSC-40) in the IHD-J assay. TPP[2,6-(OH)2] is a neutral compound with eight hydroxyl groups (Figure 1); this may give it amphiphilic properties that could play a role in blocking infection. Inactivation of vaccinia virus (IHD-J) by selected tetrapyrroles as a function of concentration. Data reported are the averages of triplicate runs; standard deviations are shown. Approximately 25 sulfonated phthalocyanines (PcS) were evaluated. Only the copper and chromium PcS were able to inhibit viral infection. The copper phthalocyanine sulfonate only had an EC50 of approximately 50 µg/mL in the WR assay in both cell lines. It was somewhat more active in the IHD-J assays, but the sulfonated phthalocyanines were not studied further. Since there are major differences in surface antigens, and presumably in the host cell receptors, between the intracellular and extracellular particles of VV [10–12], we also compared the sensitivity of the two forms to the compounds to be tested. Generally, the compounds tested were highly effective against both forms (Table 1). Comparison of the intracellular mature virion (IMV, third column in Table 1) and extracellular enveloped virion (EEV) forms of the IHD-J strain showed differences in activity of some compounds in blocking infection by the two forms of the virus. These results suggest that the tetrapyrroles may be binding to different components on the surface of the two forms of the virus and thus show differences in efficiency of preventing virus infection. The active compounds exhibited very low to moderate toxicity in assays for their effects on cell viability (Table 2). Therapeutic ratios, calculated as CC50/EC50, were found to be in a range from 64 – 1400, with the exception of ZnPPIX, for which the ratios were in the range of 1 – 3. The compounds were also tested in CV-1 cells and a human cell line (HeLaS3) for their effect on cell growth (Table 3). The compounds tested generally inhibited CV-1 cell growth at high concentrations, and 3H-thymidine uptake in HeLa cells by 50% only at concentrations above 20 µg/mL except for Co(III)TPP(2,6-F2)S (CC50 < 5 µg/mL). Therapeutic indices of selected tetrapyrroles. aCV-1 cell viability was determined by trypan blue assay as described in Materials and Methods. Effects of tetrapyrroles on cell viability and growth. aCV-1 cells were seeded at 3.5 × 103 cells/well and allowed to attach overnight, then the compounds (in growth medium) added. Following 24 h incubation, the cells were counted. bThese results were obtained by measuring 3H-thymidine uptake using HeLa S3 cells. The ability of a number of tetrapyrroles to inhibit virus replication was determined in CV-1 cells infected with the WR strain in the absence of compounds. Following virus adsorption (2 h), compounds in growth medium were added to the cells. After 16 h post-infection, cells and media were collected, virus was released by freezing and thawing and virus yields determined by plaque assay. Reduction of virus yield was observed with all compounds assayed (Table 4), with most compounds resulting in 95 – 99% reduction at 50 µg/mL. These results indicate that infectious virus production is being inhibited by these compounds. aCV-1 cells were infected with the WR strain at 2.5 pfu/cell and then media containing compounds at 50 or 25 µg/mL were added; at 16 h post-infection, the cells and media were collected for virus titration by plaque assay. % inhibition = (1 - TA/TB) × 100 where TA is the average virus titer in the presence of the tetrapyrrole and TB is the virus titer where no compound was added (control). Virus titer in the control was 1.6 × 107 pfu/mL. Data are means of duplicate experiments. These results were compared to those of other experiments in which the compounds were removed before viral titration was done (Table 5). The effect on viral yield was found to be significantly reduced when the compounds were removed prior to harvest, indicating that the inhibitory effect occurs predominantly after viral release. Using a lower moi (0.001 pfu/cell), and removing the compounds before the viral harvest resulted in reduction of viral yields by as much as 98% (Table 6), indicating that the compounds block multiple cycle replication of the virus. Inhibition of virus spread by these compounds has also been observed when the tetrapyrroles were included in the overlay medium in a plaque assay. After 44 h, the cell monolayers were stained and the plaque numbers determined. We observed substantial reductions in plaque numbers and size (data not shown) indicating inhibition of both virus infection and spread. aCV-1 cells were infected at 2.5 pfu/cell and then treated with compounds at 50 or 25 µg/mL; at 16 h post-infection, the medium was removed and cells were washed and harvested for virus titration by plaque assay. Virus titer in the control was 2.1 × 106 pfu/mL. Data are expressed as means ± std of triplicate experiments, each replicated twice. % inhibition was calculated as described in Table 4.
aCV-1 cells were infected at 0.001 pfu/cell and then treated with compounds at 50 or 25 µg/mL; at 24 h post-infection, the media were removed and cells washed and harvested for virus titration by plaque assay. % inhibition = (1 - TA/TB) × 100 where TA is the average virus titer in the presence of the tetrapyrrole and TB is the virus titer where no compound was added (control). Virus titer in the control was 2.5 × 105 pfu/mL. Data are expressed as means ± std of triplicate experiments, each replicated twice. Photoinactivation of viruses by diamagnetic porphyrins and phthalocyanines has been widely studied [13–20]. Photoactivation involves absorption of light by the tetrapyrrole with resulting production of free radicals and singlet oxygen. In the current study, inhibition of vaccinia infection is not due to photoactivation of the tetrapyrroles, as shown by two aspects of the experiments. First, there was little exposure to light during experiments, with no additional irradiation. Second, we observed that the extent of inactivation was not a function of the spin state (diamagnetic or paramagnetic) for metal chelates of the porphyrins and phthalocyanines. Only diamagnetic tetrapyrroles are able to inhibit viruses via photoinactivation; the excited states of the paramagnetic derivatives have short half-lives and do not give significant amounts of free radicals or singlet oxygen. Tetrapyrroles previously have been reported to inhibit certain other viruses by mechanisms not involving photoactivation. A cationic phthalocyanine was reported to inhibit human rhinovirus type 5 (RV-5) infection . Selected porphyrin derivatives inhibit specific viral targets including retroviral reverse transcriptase [22–26] and HIV-1 protease . In previous studies of the antiviral effects of porphyrins, Song et al. investigated the antiviral effects of Fe meso-tetrakis(3,4-disulfonatomesityl)porphyrin (FeTMPS), and meso-tetra(4-carboxyphenyl)porphyrin (TPPC) and its iron and nickel chelates for a variety of viruses . EC50s were generally 20 µg/mL or greater for VV, VSV, HSV-1, HSV-2, Coxsackie virus B4 and poliovirus-1. FeTMPS showed activity in this range also for parainfluenza-3, reovirus-1, and Semliki forest virus. FeTMPS was more active for sindbis virus, VZV and CMV, with EC50s of 5 to 25 µg/mL. Fe and Ni TPPC were also quite active against CMV. Porphyrins and metalloporphyrins have also been shown to have antiviral activity against HIV [23–38]. Previous studies indicated that some porphyrins inhibit the interaction between the virus envelope protein and its receptors [28, 31–38]. We have shown also that porphyrins block infection by HIV-1 and that this activity appears to be a result of an interaction with the envelope protein . In this regard, the compounds that were active in blocking infection by HIV-1 tended to be sulfonated compounds or other negatively charged compounds. In the present study, it is of interest that the uncharged molecule TPP[2,6-(OH)2] was one of the most active compounds tested. This result indicates that the activity of this compound with VV is not merely a reflection of an interaction between a negatively charged molecule and positively charged sites on the viral surface, but that other structural features are important for interaction with viral proteins. Although the WR and IHD-J strains exhibited similar sensitivity to most of the compounds tested, some differences in their relative sensitivity was observed. The WR strain was 3- to 6-fold less sensitive than IHD-J to several compounds including TAnthPS, CuHPIX, and TPP2FS, but was about 3-fold more sensitive to inhibition by TPP[2,6(OH)2]. These results support the conclusion that the compounds block infection by interacting with specific viral protein(s), and that strain-specific differences in protein structures determine the differences in sensitivities to specific compounds. The sensitivity of the activity to relatively small structural changes in our work indicates either that amphiphilicity and steric and specific axial ligand effects significantly control binding to the virion target, or that more than one mechanism of inhibition is operational. EC50 data obtained from both viruses studied ranged from 0.05 to 40 µM. This range is comparable to that observed for other compounds active against vaccinia. For example, cidofovir, an acyclic nucleoside with activity against a variety of DNA viruses, used clinically in some instances , has been shown to be effective against a number of poxviruses with the following EC50 values: 2.3 µM (camelpox), 46.2 µM (vaccinia), 27 µM (monkeypox) and 58 µM (cowpox) [40, 41]. Other classes of compounds have been tested for their effectiveness against vaccinia virus including the IMP dehydrogenase inhibitors (EC50 4 – 100 µg/mL), OMP decarboxylase inhibitors (0.02 – 15 µg/mL), and polyanionic compounds (0.1 – 20 µg/mL) . In conclusion, we observed that both porphyrins and phthalocyanines have substantial antiviral activity against vaccinia virus. 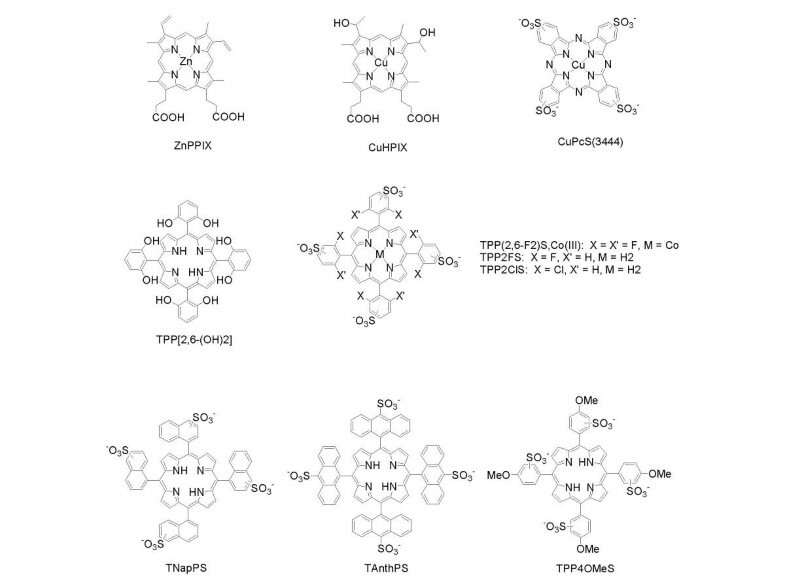 Examples of the natural porphyrin, sulfonated tetraphenylporphyrin, neutral tetraphenylporphyrin and sulfonated phthalocyanine classes were all found to be active. These results, as well as the high therapeutic ratios observed, indicate that these compounds represent attractive candidates as antiviral agents to control poxvirus infection. This study was supported by NIH grant AI45883. The authors thank Atia Alam and Dahnide Taylor for technical assistance and Tanya Cassingham for assistance in preparing the manuscript. Author ARMC carried out most of the experiments and wrote sections of the manuscript. Author DWD supplied compounds for the study, performed the data analysis and wrote sections of the manuscript. Author ANV designed experiments and performed initial experiments. Author LGM supplied compounds for the study. Author RWC designed experiments and wrote sections of the manuscript.